Once per turn: You can send 1 monster from your hand to the Graveyard, then target 1 Level 4 or lower Zombie-Type monster in either player's Graveyard; Special Summon that target. This card must be face-up on the field to activate and to resolve this effect. 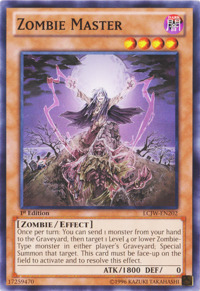 Skull Servant and Reborn Zombie appears in this card's artwork. The artwork of Dark Eruption appears to depict the aftermath of this card's artwork. This monster appears in the card artwork of Uni-Song Tuning. This card’s effect targets 1 Level 4 or lower Zombie-Type Monster when activated. If you activate “Zombie Master’s” effect, and an effect is chained that removes “Zombie Master” from the field or flips it face-down, the effect disappears and you cannot Special Summon the targeted monster. You can Special Summon the monster sent to the Graveyard as a cost to activate this effect. You cannot activate "Zombie Master's" effect if there are no Level 4 or lower Zombie-Type monsters in the Graveyard, even if you would discard one to activate the effect. Zombie Master's" effect is a Spell Speed 1 effect, so you can't chain it to a Spell Speed 2 effect like "Book of Moon", "Bottomless Trap Hole", "Torrential Tribute", "Compulsory Evacuation Device", etc. : Clarification on Zombie Master-effect negated?